UMAR Boxing is a nonprofit after-school program that provides boxing training for children who participate in academic tutoring. They deal with many of the same challenges as other amazing inner city organizations, which is why designers Mark Alcasabas and Virginia Sasser decided to help. They found out about UMAR Boxing from a wrinkled flyer that had been photocopied hundreds of times. 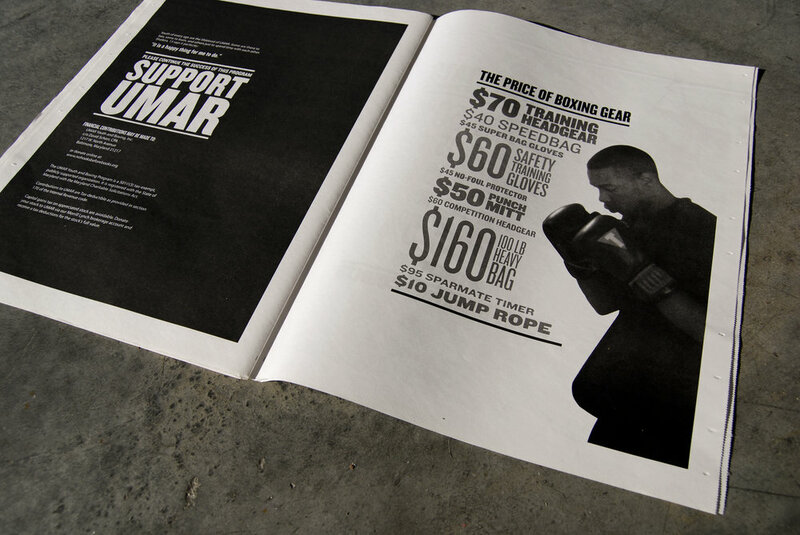 Over the course of a few months, they not only re-designed the flyer for UMAR Boxing, but also a 32-page tabloid that demonstrates their importance as a tutoring center and a boxing gym, as well as its very real need for funding. Helping a boxing gym promote their unique boxing/educational program as a way to get children off the street. Building trust with the community by regularly visiting the gym, documenting the activities there, and getting to know the boxers, trainers, and children. Using the gym's visual culture and the aesthetics of the West Baltimore neighborhoods as an inspiration. Two thousand copies of the tabloid were printed and are being used by UMAR Boxing to spread its message and attract donors.